The Belgian and The Aussie: Hiking with snakes, is our RV large? 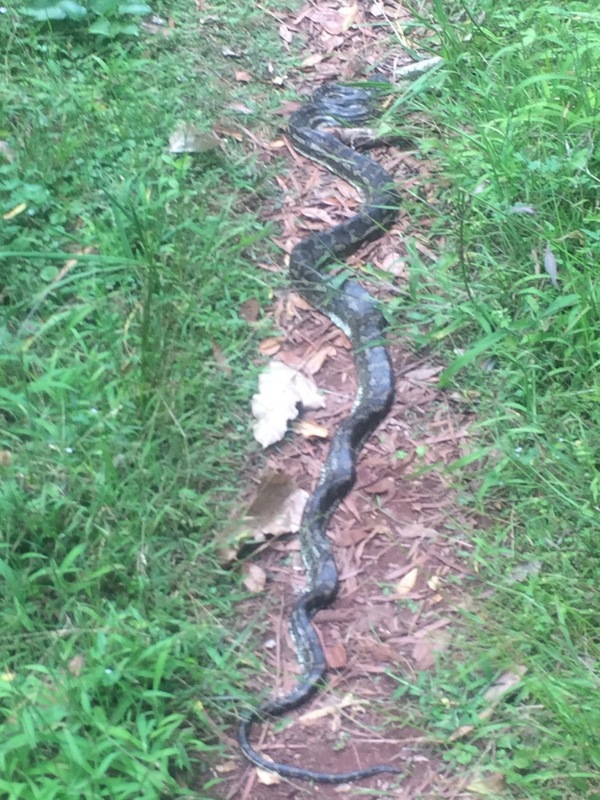 Hiking with snakes, is our RV large? At the end of February and into March I'd decided that we should do more hiking. Queensland national parks mostly have camping (currently just $6.15 per person per night, regardless of facility or popularity) and well defined hiking tracks. In Main Range National Park's Goomburra section there was only one other camper, a lone man in a bus biggest than ours. He told H that he stays 3 weeks in a location and then heads to town for supplies before moving to the next NP camping. $6.15 x 7 nights = $43.05, no bills for power or water, he drives occasionally, we all have to eat .... that's cheap living! Hiking here we saw 2 snakes and many wallaby. The first of the two snakes quickly slithered off, as they usually do, and I didn't see enough to say what it was. The second though, a 2 metre carpet python, was lying along the path and wasn't interested in moving. Carpet pythons aren't considered dangerous, but still I wouldn't want to get struck by one. I tossed my sunglasses at it and it aggressively went at them. Seeing that it wouldn't move we used a long stick to retrieve my glasses and we went through the stinging nettles to go around the snake. 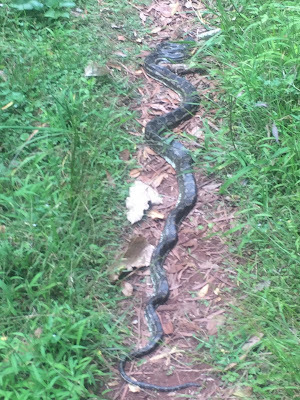 The snake that wouldn't move off the path. Next we stopped at Cunninghams Gap (another section of Main Range NP). On the hike we discovered that leeches like H more than me. I felt one on my leg before any attached themselves, but at that time H discovered he already had many attached. Next we went to Spicer's Gap. Apparently the road up isn't suited to large motorhome, but what's the definition of a large motorhome? Is ours large? There's bigger ones. We went without trouble, and we stopped at the picnic area and hiked from there. Honestly, the road beyond the picnic area isn't suitable for large RV's. 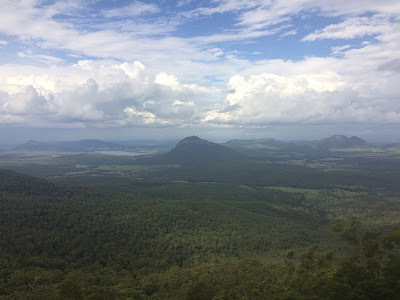 The view from Governors Chair, Spicers Gap, Main Range National Park. The Governors chair is well worth the hike up. The camping ground is really just for tents. But as it was late and had just started raining, actually 'bucketing' rain, we got online and booked a campsite. It wasn't busy up there and we think it was safer that we stayed put. Next we stayed in Lamington National Park, in the Binna Burra private campground. More hiking, and we joined the lodge on a evening wildlife spotlighting hike, it was too windy to see much (other than lots of wallaby... guide not needed!) but the guide did coax a spider from a hole which impressed me. The views in parts of Lamington National Park are quite impressive. Next we would have liked to visit Springbrook NP, but apparently you should book its camping in advance. It's a great park but I think it's popularity can be attributed to its proximity to the Gold Coast. 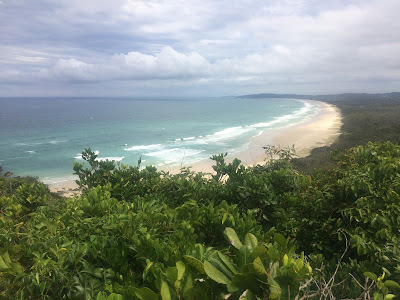 Then, after an overnight visiting friends on the Gold Coast, we headed down the coast. Because, as I said to H, you should visit the towns of the Northen New South Wales coast. Why? I think for the alternative vibe. A view from the way up to Cape Byron Bay Lighthouse. We cycled up!